Alright, since I tend to write A LOT for my race recaps, I thought I would try to break it up a little this time. 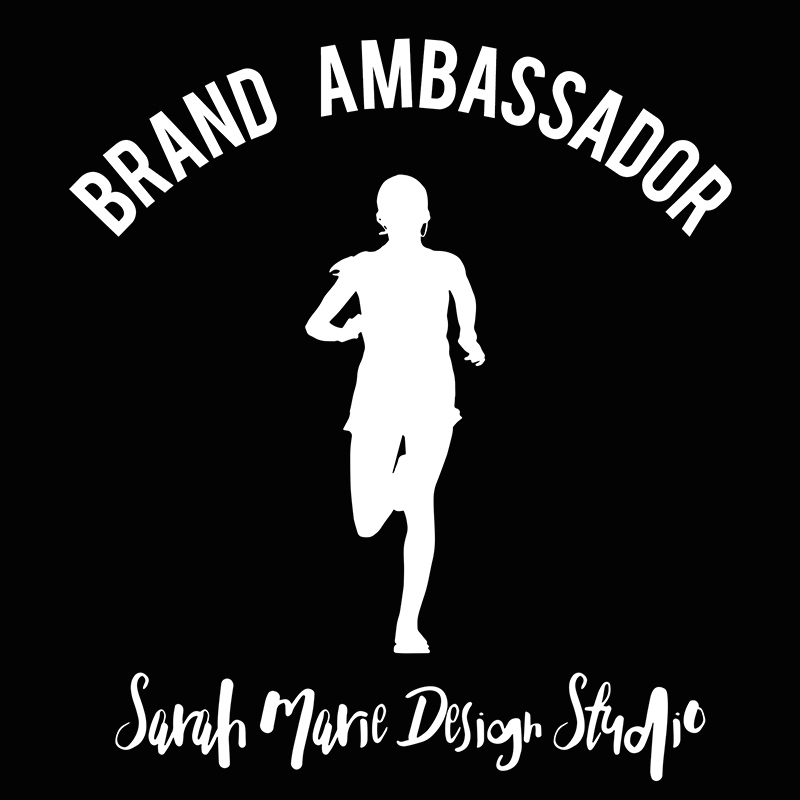 I am planning on doing a costume post (about getting it all together), "pre" race (including the Expo), race (even though we didn't take pictures with characters or stop along the course, I'm sure there will still be plenty to tell you), and then maybe a "post" race (including a little park time - but this may be lumped in with the "race" post because I'm not sure how much I will have to share or if I want to drag it out over 4 days ;) ). I have to be honest, I wasn't feeling too inspired for this race. 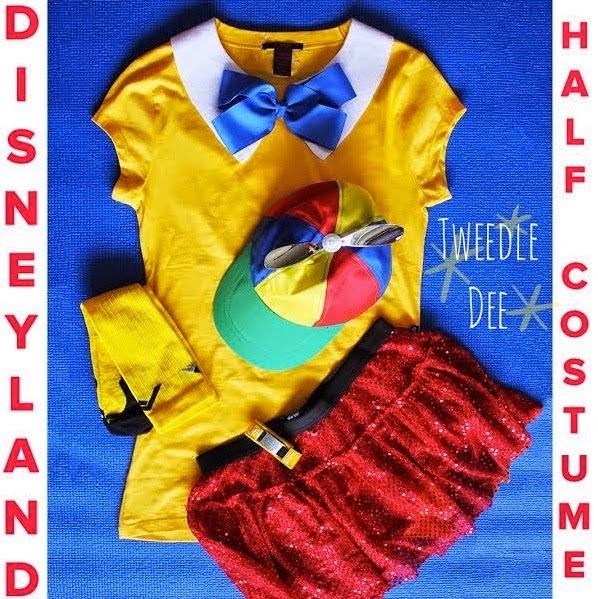 Since the Disneyland 10K and Disneyland Half aren't necessarily "themed" races, I feel like you can do just about anything for your costumes. The Avengers theme seemed a little too specific for me. I didn't want to do the same thing as everyone else. I even watched The Avengers a few weeks back just for some inspiration. I thought that maybe I could so something OTHER than a character. 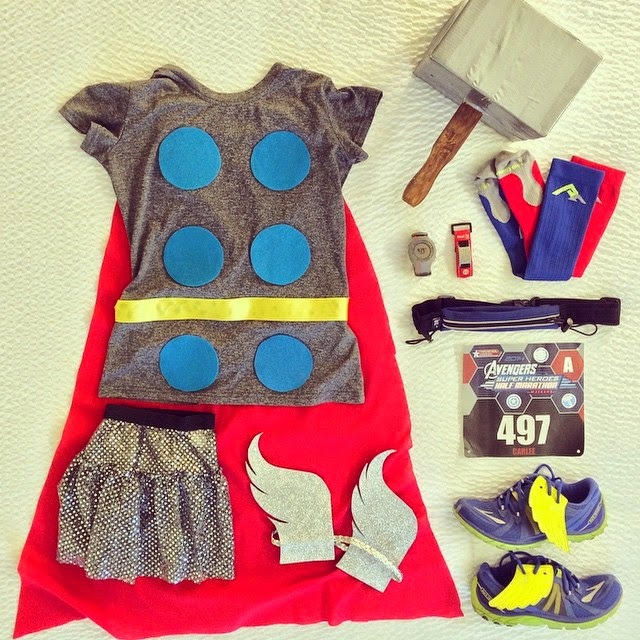 My first thought was Thor's hammer (but I wasn't sure how attaching something large to my head would work out for 13.1 miles). Then I thought of going as the tesseract (but then I couldn't think of a way to NOT run in a cardboard box for a half marathon). I was trying to think OUTSIDE of the box, but everything ended with me running INSIDE a physical box and I didn't think I could pull it off for that distance. I took it as a challenge! Now to get the creative juices flowing... I decided the easiest way to decide on a costume was to rule out what I didn't want to do. Now remember, Shane called me out on Wednesday evening. The race was Sunday. 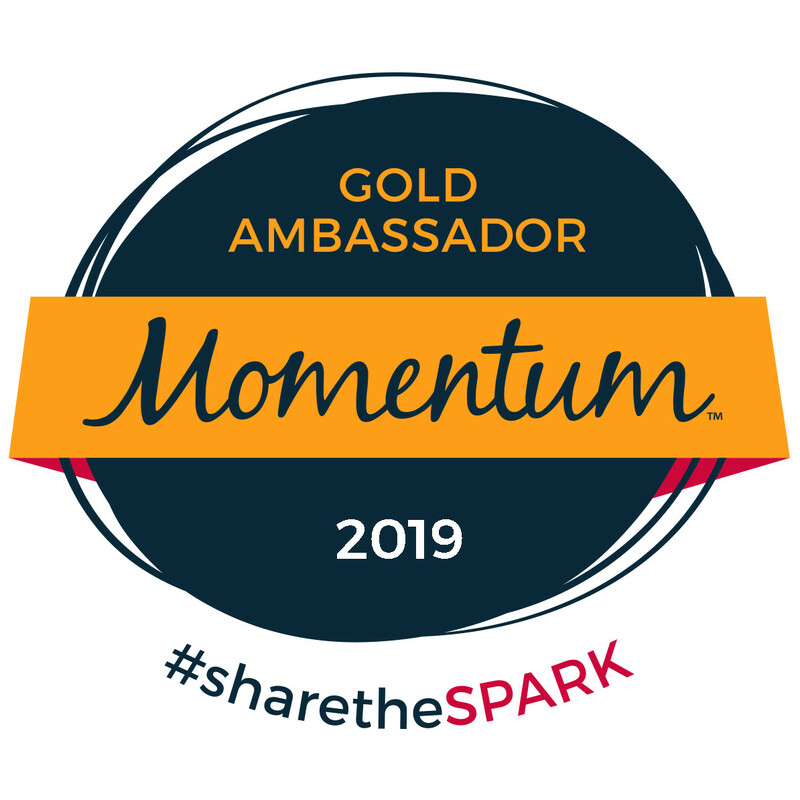 I would be working at the Expo (at the Sparkle Athletic booth all morning) and going to San Diego for a concert all day (and night) Friday. This left pretty much Thursday and part of Saturday to create and finalize my costume. Thursday morning I tried to do some research. 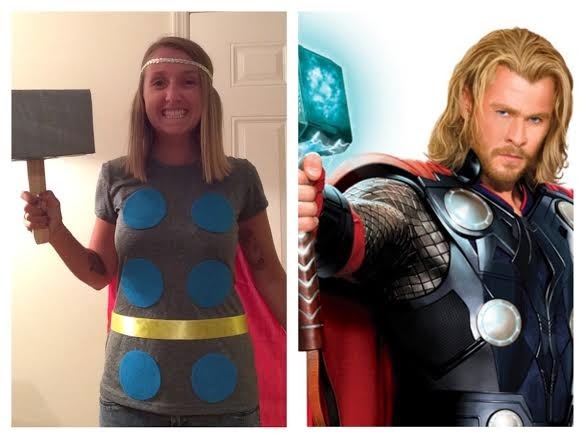 I looked up Thor shirts and decided I could do something more like the comic book outfit he wore (rather than the Hollywood version). There are two other main features of Thor's overall appearance - a hammer and the winged helmet. 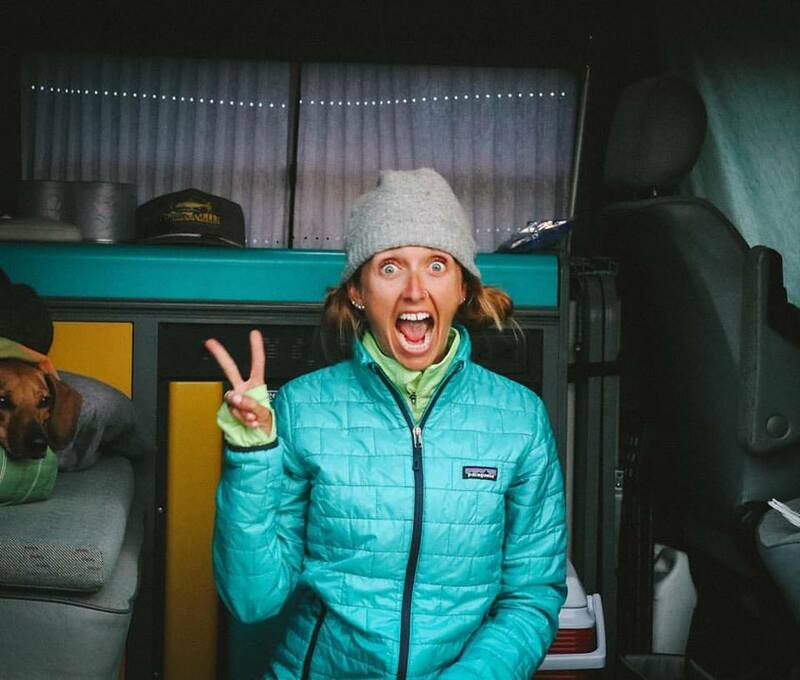 I looked online to see about the hammer, but I couldn't find anything reasonably priced ("reasonable" for using it for one race and potentially dropping it if it was too much of a hassle to run with). I figured I could make one. I also looked online for Thor helmets, but they seemed bulky and very plastic-y and not very running friendly. So, yep, you guessed it, I would have to make that myself as well! I ended going to the dollar store (but found NOTHING), Walmart, and Michaels to get all of the supplies. I got aqua felt for the circles on the shirt, yellow ribbon for the belt, a red fabric for the cape, floral foam, a large paint stirring stick and duct tape for the hammer and sparkle foam board for the winged helmet. I don't sow, so the hot glue gun became my best friend! I used a coffee mug to trace out the circles for the shirt. I put my top on and placed a little piece of tape where I thought the circles should go (I didn't want them to look inappropriate so figured it better that I didn't guess where they should be attached). 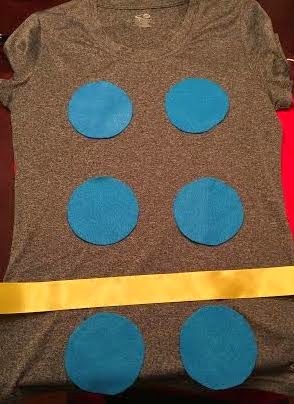 Once I had a guesstimate of where they should go I just loaded the felt circles up with hot glue and plopped them on the shirt. I did the same thing with the "belt"; cut some ribbon, loaded it up with hot glue and plopped it on (because the shirt is a dark grey you could see the glue behind the ribbon, but it wasn't too terrible). [I decided to only glue the ribbon to the front of the shirt because I didn't want to have an issue putting it on. I safety pinned the ribbon together in the back once I had it on.] As far as the cape, I bought 2 yards of pre-cut fabric (it was only like $4.50), so just sort of free handed an outline and cut it out. You guessed it... I loaded it up with hot glue and plopped it on the back of the shirt. I wasn't sure how heavy the cape would be, so I did add two heavy duty safety pins at the top of the cape just in case. Now it was time for the hammer. I put two of the rectangle floral foam blocks together with hot glue (I did this twice). I then cut the large paint stirring stick down by about 4 inches (with a extra large bread cutting knife that reminds me of a saw) so it was a little more manageable. After that I hot glued the larger rectangle blocks to both sides of the stirring stick. 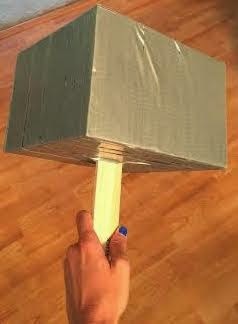 Once the glue had dried I covered the whole thing with duct tape to make it look silver like Thor's hammer. I also used a stain marker Ryan had (he does art on wood so has a ton of them in the garage) to make the handle a little darker to try and match the overall look. The winged helmet was another story... I decided attaching something to a headband might be a little easier than actually trying to make a helmet. One of my friends had made me a bunch of headbands a while back and one the them was a silver braided material. 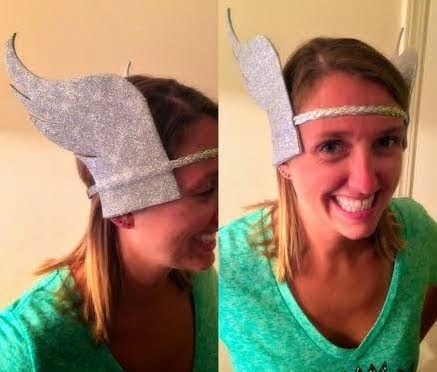 I thought it would work GREAT as the base (and I didn't want to potentially ruin one of my coveted Sparkly Soul headbands) - a friend even mentioned it looked sort of goddess-y. Ryan helped freehand the "wings". The sparkle foam was actually sticky on one side, which was PERFECT. We ended up drawing the mirrored design on the backing and then stuck it to itself over the headband so it was secure. PS I know the pictures of the costume making aren't perfect... I never intended to use them for my blog... I was actually using them to text to friends to get their input on the costume ;) Hence the low quality. When I got the below picture texted back to me I knew I was on the right track. 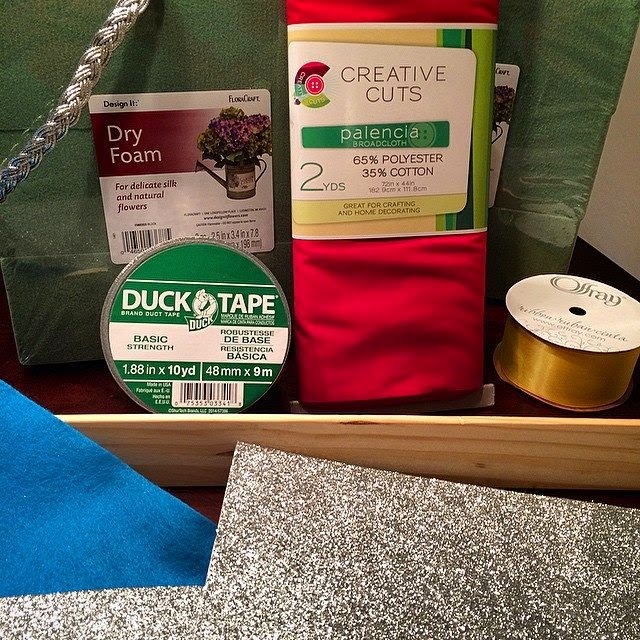 An AMAZING friend of mine, Shelby, posted that she was making SPARKLY CAPES for her Pro Compression socks... OH SHUT THE FRONT DOOR! I asked her and she said that she had extra... I knew I was going to do #TwoPairDontCare (meaning wearing non-matching socks), and asked if she had a blue and red cape (for a red and blue sock) and she did! OH HOLY AWESOME! 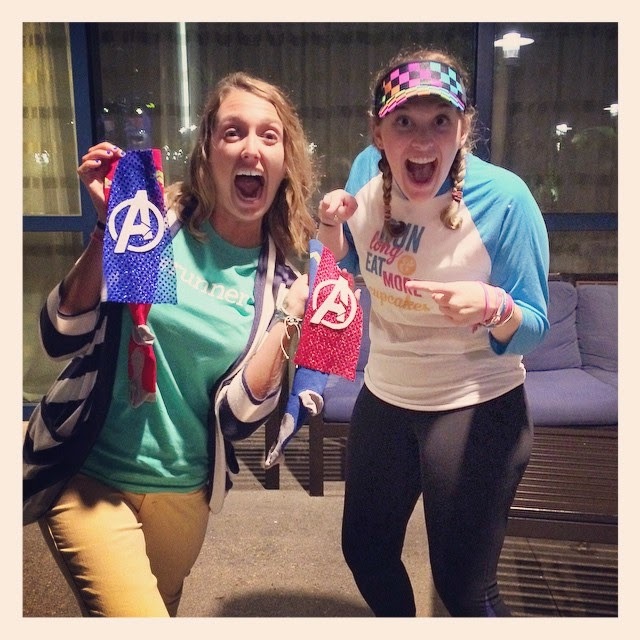 We met up Saturday night to attach them to my socks! 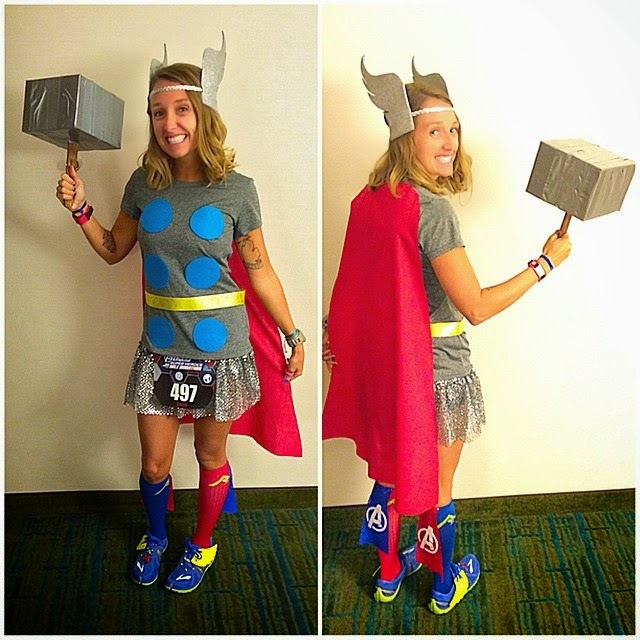 This was the first time I was planning on wearing my hair down (Thor had a wavy hair, so I actually curled mine the day before and then slept on it and was left with a wave) while running, sporting not one, not two, but THREE capes, AND carrying a prop in my hand for 13.1 miles... I wasn't quite sure how it would work out logistically, but at least I would try to look good in the process. Ryan took a couple pictures before we left the hotel race morning. Had to get a "back" shot to show off all the capes! I got a TON of compliments (I don't know if that is because it actually looked good or because there weren't many costumes on the course so it just "seemed" decent). And I guess you will just have to wait for the race recap to see how it worked in action! **And how could I forget?! 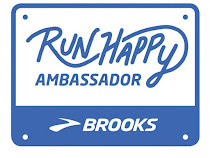 The LOVELY LADIES over at the Runners Guide to WDW Magical Miles have a post about runDisney Costumes AND it even includes TWO GIVEAWAYS - one for a Sparkle Athletic skirt (one can NEVER have too much sparkle!) 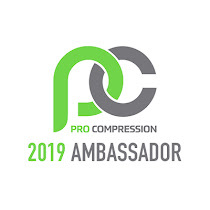 and one for a pair of Pro Compression socks or sleeves (you know you always need to #KeepItTight!). Check it out and get your name in the drawings (or not and give me a better chance of winning ;)). 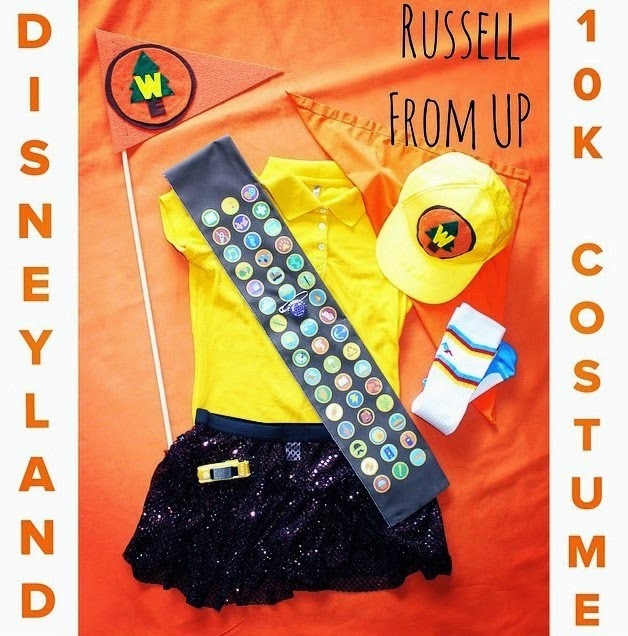 PS They were even nice enough to give my Disneyland 10K costume a little shout out in the post, so make sure to click over and give it a read! 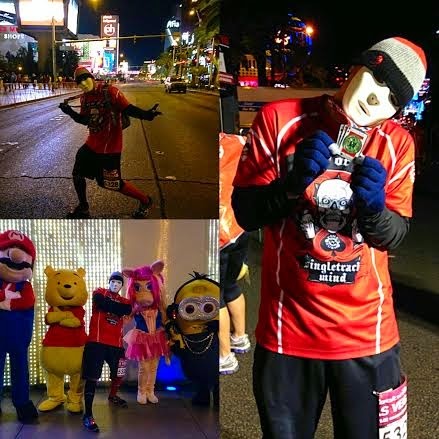 Have you ever run in a costume before? Super cute! Great job, I bet no one guessed it was a last minute creation. P.S. So hey, why weren't you at Rock n Roll Vegas?? Love it! And I'm sort of dying of your friend's Jabbawockeez costume. Ah-maz-ing. OMG, you are so stinking cute! Love the costume!